Kim Witzcak, advisor to MISSD, has recently been appointed as a consumer representative on the FDA’s Psychopharmacologic Drugs Advisory Committee. In her interview with the Star Tribune in Minnesota, Kim discusses akathisia and other significant topics relating to drug safety. 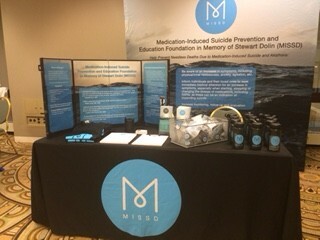 MISSD is exhibiting at the American Association of Suicidology (AAS) conference, Chicago, IL. We have had wonderful opportunities to speak with health professionals working crisis center hotlines about the importance of asking callers in crisis if they have recently started a new medication, stopped their medication or dosage and screen for akathisia or a medication-induced suicide reaction.